What's blooming in my garden today is my Adenium obesum (Desert Rose) in shocking pink. I'm glad it coincides with Blooming Friday's theme today of "Perfect Pink Pouts". This the Lagerstroemia speciosa tree in front of my house. It's common name is Pokok Bungor Raya (Malay), Banaba (Philippines), Pride of India, Queen's Crape-myrtle. It was planted by the housing developer. I took good care of it. It has been blooming intermittently for a few years already. This year, the buds started to form in early February just as I was welcoming Lichun Day and by early March it was blooming profusely. I just love the lavender purple flowers which has 7 petals each. One by one, the flowers will drop to the ground like money falling from the sky. This is because whenever it blooms, good luck comes to me. On the tarmac road, they look like purple cherry blossoms. These flowers attract bumble bees, butterflies and I see birds on its branches too. Can you see the fruit on my ixora plant? These berry like fruits turn from green to dark purple but they are not edible. Helen (islandgal246) of My Rustic Bajan Garden once told me in a comment that the best time to photography butterflies is in the early morning. That's the time when some of them has just emerged from their chrysalis and would need to dry themselves just before their maiden flights. And yes, that was how I found this butterfly on my champacca tree, lying quite still on the leaf. It was long enough for me to take a few close-up shots. Do you still remember my pineapple plant that bloomed in February? Well, after the Chinese New Year season was over, I harvested the small, little fruit and this is what I get. Three slices of sweet, juicy pineapples. I caught this spider crawling around my window pane. It looks like those spiders that the boys like to catch and bring to school for a game of spider fighting during my younger days. While watering my plants, I stumbled upon this nest on my flower bed. It looked like it has just fallen from my palm tree above. So, I took out the nest from the bushes and peered inside. Look what I found! There are 5 little birdies, huddled together in the nest. So, I called out for My Dear's assistance. We took a tall ladder and put the nest back to the palm branch, using a rafia string to tie around its nest to make sure that it will not fall again. We also made sure that its position was at a height that was difficult for the cat to reach. That night, I prayed that it will not rain heavily as I was not very sure whether we had place the nest correctly. Well, it rained heavily that night and I was very worried. The next morning, to my utter joy, I heard the sound of birds chirping happily. Now, I can hear this sound whenever mummy bird comes back with food for the babies. Mummy looks like a little black sunbird. Now I feel so relieved that I had successfully rescued my little friends. Here's another little friend on my Jasminum sambac. To this little guy, the flower look huge. I wonder what he wants to do. I would like to dedicate this post to my first commenter, Ms Lona, from Ohio, USA of Hocking Hill's Garden blog. She is posting lovely anthuriums and daffodils with a nice poem. My grateful thanks to Katarina at Roses and Stuff for hosting Blooming Friday. To see what others have posted or to participate, click here. I am delighted to dedicate this post to Ami, from Florida, USA of Southeast Florida Garden Evolvement blog, the first commenter of my previous "The Garden at Hotel Theme Park - Genting Highlands Part 2 " post. She's having "a new look for her garden corner". Go on and head over to her blog to view the lovely flowers. If you wish to buy lots of strawberries home and worry about what to do with the excess, fear not! You can freeze them and store them in the fridge. Read this post, "How To Freeze Strawberries" by Bumble Lush. This scenic view of the sky, blue mountains and the beautiful landscaped garden is what I enjoyed most when I looked out of the balcony on the lobby floor of Theme Park Hotel, Genting Highlands. I never regretted taking an early morning walk all the way here from First World Hotel where I stayed. This 3 star hotel which is nicknamed, "Castle in the clouds" is just a few steps away from the entrance to the Outdoor Theme Park of Genting Highlands Resort where all the exciting games and adrenaline pumping rides are available for the young and old to enjoy. The front of this hotel has a structure that resembles a castle and there is a manicured garden at the back. At the edge of the garden, there is a splendid view of our Malaysian rainforest. Southeast Asia's rainforests are among the oldest on Earth. Some scientists believe that our present day Malaysian rainforests may have existed over 100 million years ago. Our rainforests are home to a great number of plant species, many of which are endangered or endemic. It is also home to our endangered orangutans, elephants and the Malayan tiger (Panthera tigris malayensis, Malay: Harimau Belang). This postcard perfect garden is landscaped with the Tibouchina urvilleana (glory bush) in the center surrounded by celosia in bright shades of red, orange and yellow while rain lilies line the outer circumference. There is a stone reflexology path for visitors to walk on. Manicured cuphea bushes act as ground covers that define the boundaries around the garden. The cool temperatures here is very conducive for many flowering plants. This looks like a chinese rose in bloom. An orange daylily just about to open. A closeup of the pretty, sweet cuphea flowers in a combo of purple and white. A partially opened rain lily in shades of pink and white. Another rain lily bud is going to open soon. I was enjoying myself, breathing in the fresh morning air and clicking away with my camera while hubby was glued to his seat at the pavillion nearby, reading his newspapers. When I was finished with my photography session, I felt invigorated, satisfied and ready to kickstart my day. I am extremely delighted to dedicate this post to Ms Silke Power from Savannah, USA, of Methmorphosis blog. She was my first commenter for my previous Wordless Wednesday post titled, "Genting Highlands Flowers." She is a self taught artist and her blog is filled with beautiful and interesting posts. This is my entry for Blooming Friday, 3rd week of March 2010. The theme this week is "Summer". She also asks, "If you were to pick one single photo to illustrate Summer, which one would you pick?" I would pick my 4th picture showing flowers in full bright blooms. My grateful thanks to Katarina at Roses and Stuff for hosting Blooming Friday. To see what others have posted or to participate, click here. I would like to dedicate this post to Rainfield61, from the beautiful state of Penang, Malaysia of My Journey blog, the first commenter of my previous "Chin Swee Temple, Genting Highlands - Part 1 " post. He is a nature lover and his blog chronicles his exciting adventures off the beaten track at Cerok Tekun, Penang. Post publication update: the names are typed in red. 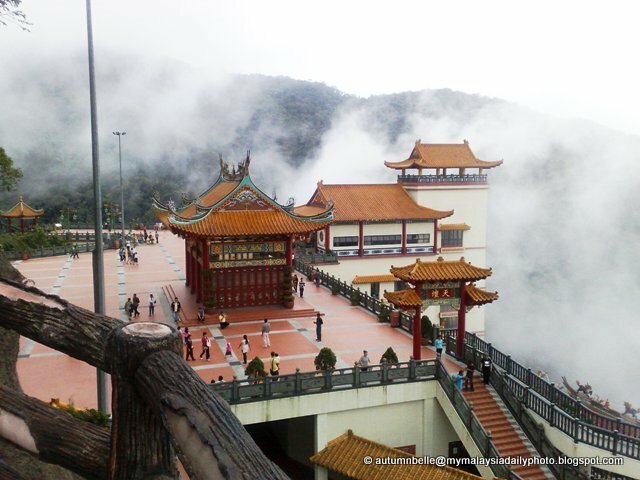 “Chin Swee Temple - Genting Highlands Part 1”, a copyrighted post, was written for My Nice Garden blog by Autumn Belle @ http://www.mynicegarden.com/ on March 12, 2010. An aerial view from Chin Swee Temple grounds. Genting Highlands is located at the peak of a tropical rainforest within the Titiwangsa Range, it highest point is at an elevation of 1,760 metres (5,800 ft) above sea level. It houses the Genting Highlands Resort that sits on the border between Selangor and Pahang states of Malaysia. It is about 51 km from our federal capital of Kuala Lumpur, or 45 min. drive by car. The pathway of the Journey to Reincarnation is depicted on the far left. Genting is also known as the 'Las Vegas' of Malaysia and the 'City of Entertainment'. It is here that you will find the only legal casinos (2 of them now) in the whole of Malaysia. But there is also a spiritual side to this resort. Recently, during the month of January 2010, we drove up to Genting Highlands Resort to celebrate our 22nd wedding anniversary. We travelled off-peak so as to escape the crowd and enjoy the peace and tranquility of this beautiful highland 'above the clouds' as it is known in Chinese (雲頂高原) . Half way up, at about 4,600 ft above sea level, we decided to stopover at the Chin Swee Temple, which according to the resort's publicity news, is situated 'at a rocky forested land on the most scenic spot of Genting Highlands'. There is a large square spreading over 35,000 sq ft, aptly named Sky Terrace (Place for Heavenly Offering) for visitors and devotees to take a leisurely stroll among the ‘clouds in heaven’. Shrouded in mist, this place looks like paradise on Earth. I was extremely delighted to find many many orange daylilies blooming here. That was the first time I ever see a real daylily plant. There's a pagoda here, partially hidden from view by the tall trees. A mythical crane, the fengshui symbol of longevity is perched at the railing and seems to be admiring the scenic views of its surroundings. Daylilies seem to do well in this place where the daily temperatures average between 14C - 25C. At first glance, I thought these were the Melastoma malabathricum (Straits Rhododendron) or senduduk as we fondly call it by the local name. However, based on the flower colour, I think they are the Tibouchina urvilleana or Princess Flower (Glory Bush). This is a monument with the statue of the late Tan Sri Lim Goh Tong, the founder of Genting Highlands Resort. He discovered this serene site when he started building works on the first hotel at the peak of Genting Highlands. While constructing the road leading to Genting Highlands, he spotted this cool rocky slope, covered with green tropical vegetation dotted with flowing streams, which was very similar to the Chin Swee Crag back in his native Penglai Village in Fujian, China. Here, he was inspired to build a temple similar to the original one in China. Hence, that was how Chin Swee Temple of Malaysia took shape. I like the lush variegated foliage of the croton plants in the planter below the statue. Do you think you can see some shadows of me reflected in the pink slab of granite there? I am extremely delighted to dedicate this post to Ms Tatyana from Washington, USA, of MySecretGarden blog. She was my first commenter for my previous Wordless Wednesday post titled, "Blue Vine Sariteae magnifica." Her blog and pictures are as beautiful as the places that I am visiting now. I am so glad that despite her very busy schedule, she still drops by to view and comment on my posts. This is my entry for Blooming Friday, 2nd week of March 2010. My grateful thanks to Katarina at Roses and Stuff for hosting Blooming Friday. To see what others have posted or to participate, click here. I would like to dedicate this post to Rainfield61, from our Pearl of the Orient, Penang, Malaysia of My Journey blog, the first commenter of my previous "Kesidang" post. He jungle escapades at his 'other home' at Cerok Tekun never fails to remind me of The Adventures of Sinbad the Sailor and his stories are as interesting as in 1,001 Nights! The kesidang flower is a symbol of the grace, charm and beauty of traditional Malay culture. Hence it was selected as the state flower of the historical city of Malacca. It was a popular flower a long time ago but quite a rarity now. Kesidang was documented by G.E. Rumphius in his works on the Herbarium Amboinense, a catalogue of plants of the Indonesian Archipelago, during the 17th century. Malay ladies liked to wear kesidang flowers in their 'sanggul' (hair combed into a bun). Kesidang flowers were very popular then. Perfumed flowers like the Kenaga (Canaga odorata), Yellow Chempaka (Michelia champaca), White Chempaka (Michelia alba), Bunga Tanjung (Mimusops elengi) and Arabian Jasmine (Jasminum sambac); were often used at weddings and kenduris (feasts) where the flowers were scattered on banquet tables and made into garlands to decorate festive arches. These flowers acted as natural perfume. Kesidang plants were commonly found at temple grounds, churches and stately homes, and the flowers used widely by Malay ladies, Malaccan 'nyonya' (Straits Chinese ladies) and also the Chitty (Peranakan Indian) ladies. Common name: Kesidang, Kerak Nasi, Tikar Seladang, Melati Bali, Bread Flowers. Kesidang is also known as Kerak Nasi in the northern states of Peninsular Malaysia, Tikar Seladang or Tikam Seladang in the east coast states, Sikudangan in Johor state and Bread Flowers in the west. "Kerak Nasi" means rice crusts. "Tikar" means mat while "Tikam" is grip. "Seladang" is a wild oxen which is native to South East Asia. The clusters of little white flowers has the colour of and the aroma of rice crusts, hence the name 'kerak nasi'. In Pakistan, it is known as Soniya or Buttercup Vine. Kesidang is grown for its flowers which are very fragrant. It has the scent of cooked pandan leaves. Some people say it smells like slightly burnt rice, hence the name 'kerak nasi'. Some say it smell like freshly cooked fragrant rice. I think it smells like nasi lemak! Yet some others tell me it's a love-hate affair. Either you love the fragrance or you hate it. Those who hate it can't stand the scent as it gives them a headache or migrane. I love it because I love pandan and I also love the scent of slightly burnt rice. Kesidang flower is an ingredient in the making of 'bunga rampai' or potpourri used at Malay weddings and spas. The ingredients used are fresh rose petals, thinly sliced pandan leaves, fresh champacca petals, kesidang, jasmine and plumeria flowers. Mix them all together in a bowl with a few drops of jasmine oil and put the bowl in a room or near a bed for a romantic aromathery. Peranakan people like to sprinkle bunga rampai flowers on the marital bed. Put the ingredients in a potpourri bag and you can hang it in the car as an air freshener. Place some kesidang flowers on your work desk. Its mild but lasting aromatic scent is very therapeutic. It soothes and calms your nerves. Kesidang is a tender, tropical perennial woody climber that can grow up to a height of 6-10ft. It is suitable for pergolas and trellis, can be trimed it into a bush or hedge or grown in a container. It needs full sun exposure for it to bloom. This plant is easy to care for and it is a hardy plant that can tolerate a wide range of conditions. Water it regularly but do not overwater. It's flowers are attractive to bees, butterflies and birds. When plucking the flowers, be careful of the white sap that oozes out. If it gets onto your hands, it may be difficult to wash off with just soap and water. Propagation is by layering, i.e. marcotting (air layering) and ground layering. Anchor a portion of the stem to the ground with a brick. Roots and shoots will grow to develope into a new plant. I can still find the kesidang in suburban areas and the countryside. The photos in this post is taken at The Secret Garden of 1-Utama. You can also find a specimen tree growing on a pergola at the Kuala Lumpur Hibiscus Garden. We can buy the seedling from nurseries around town for about RM 10.00. This plant is also listed in the websites of Top Tropicals and Dave's Garden. Like in the old days, kesidang is best grown near a balcony, in the patio or beside a window. When you open the window in the morning, a fresh light fragrance fills your room and linger in the air. On a pergola, it branches out like an umbrella, so put a bench underneath where you can sit down and enjoy its aromatic scent. Many folks here have fond memories of carefree days in the kampung or village, playing and chatting with friends under the kesidang tree. I am extremely delighted to dedicate this post to Ms Ami from Florida, USA, of Southeast Florida Garden Evolvement blog. She was my first commenter for my previous post titled, "Lily Magnolia Flower." I am so happy to find her blog which is filled with many many lovely plants and flowers very similar to those in my own country. En Abu Hassan Jalil -"Kekadang terpandang Kelulut sedang bersidang di bunga kesidang". Ms Junie Lee - "Keharumannya tidak terhingga kata, maka menawan kelulut tuk bersidang di persidangan Khas bunga kesidang!" (The words are posted here with their permission). 1.You can click on the links provided at places where text are in green. 2. To view my article about the Kesidang "Scented Gardens" published by New Straits Times, click here. This is my entry for Blooming Friday, 1st week of March 2010. My grateful thanks to Katarina at Roses and Stuff for hosting Blooming Friday. To see what others have posted or to participate, click here. I would like to dedicate this post to Florida Girl from USA, of Peace in the Valley blog, the first commenter of my previous post, "My Yellow Daylily." She is a nature lover, a passionate gardener and great photographer. These traits are reflected well in the gorgeous pictures she posts in her lovely blog. I am delighted to discover that we share many common plants in quite similar climate zone.